Christopher R Lockwood, Life In Our Galaxy. Lulu, 2012. Pp. 68. $9.01. 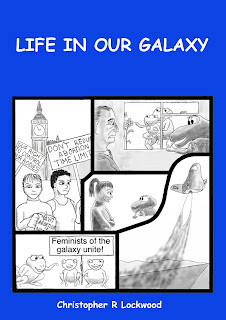 Life In Our Galaxy, written by Christopher R Lockwood and self-published via Lulu.com, is a contemplative and graphical new text that leaves you pondering its contents some time after you have put it down. While it struck me that it attempts to achieve a great number of things—education, activism and the exploration of ethics on both sides of the arguments around abortion—within its simply drawn pages, it nonetheless left me wondering how well these aims were then met. From the comic sans title, ‘brochure-ish’ design and cartoons that are economically drawn, you might be forgiven for thinking you’ve been handed a purely educational document that could have been found in any secondary school or sexual health clinic. While the content is clearly meant to educate, the text’s layered handling of the abortion issue leaves you with few actual answers besides the notion that the debate is perhaps more complicated than you originally thought. 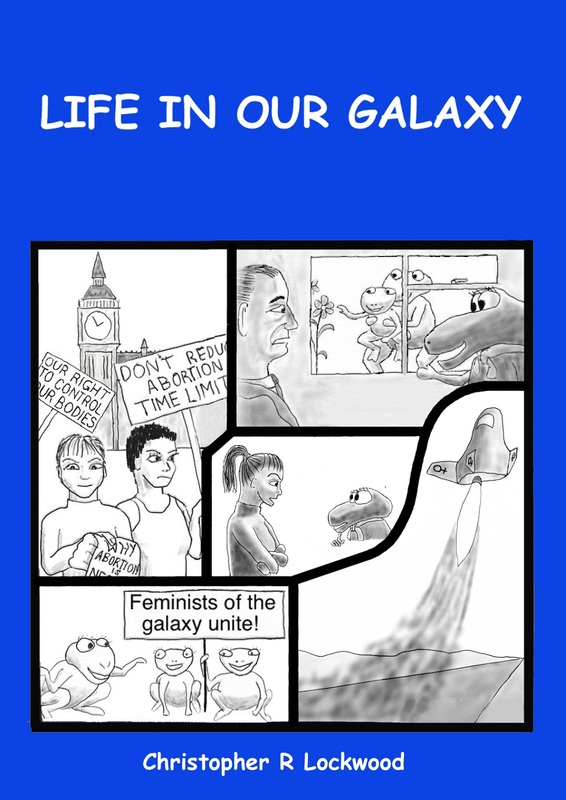 Life In Our Galaxy wants to teach you the various and complicated arguments surrounding pro- and anti-abortion campaigns in a very visual way. To do so, you essentially follow the path of Karla, a diligent feminist activist who finds herself exploring the universe, meeting numerous intergalactic species and trying to understand the initiation of life from a variety of perspectives. The way the book progresses is by introducing Karla to different alien species that share similar aspects of procreation to creatures we see (or are aware of) on Earth. So, there are alien species that look like frogs, some like dinosaurs, others like kangaroos and so on. Many of these aliens have conflicting ideas about when life starts for their species and you are perhaps meant to consider latterly that such ambiguity exists within our own abortion discourses. Karla is often joined on her journey by a Catholic Monseigneur who is spreading a very different message, a religious anti-abortion perspective. Between them they find that, as on Earth, their arguments continue to conflict but that they also have things in common. They are also often shocked at the debates on other planets and their personal views are challenged wherever they go. It becomes clear for example that a feminist perspective on one planet is very different on earth. I enjoyed the way the story explains the various perspectives and uses different animals (aliens) to describe the different approaches to life. I’m certain that the text aims to wholeheartedly contribute to the abortion debate, however I was left unconvinced that introducing various alternative species as a means of comparison and debate really helps. The human abortion debate doesn’t need to dwell on the fact that frogs, for example, have a great deal more spawn than us and that they consider the viability of life to come later in a unique tadpole’s existence. Life In Our Galaxy endeavors to stay impeccably neutral on the issue but in doing so it somehow makes the feminist argument sometimes appear somewhat reactionary while the deeply religious and unscientific assumptions regarding life are never really challenged. It further opts to consider the ethical and philosophical arguments without ever really engaging with the contemporary scientific. Although the reader is thrown around the ethical cauldron a little too sporadically, the text gives you plenty to contemplate and is genuinely engrossing. However, the human ethics of abortion do not include the way various species of animal consider life viable and there is little reason, I feel, to do so. Where the story arguably adds significant and valuable contribution is where it speculatively considers artificial wombs. If the potential success rate of such wombs meant survival was certain and that all fetuses were viable, would this mean such fetuses had rights? Has life technically begun at that stage? How are the rights of the parents considered? The text probes these themes deeply and, while it asks more questions than it answers, it does provide some valid points regarding the future of the debate. If the ethics of abortion interest you, I think the story will provide some food for thought. While I feel it neglects to consider one or two arguments—such as the notion of consciousness in a fetus and how much dogma plays in the forming of religious perspectives on abortion—it is otherwise thorough and thought-provoking. It is a highly speculative piece and the reader is asked to put aside their own views in order to engage from a completely different angle. If you are open-minded and happy to be challenged, this may be superb fodder for a philosophical exploration of life as we know it.